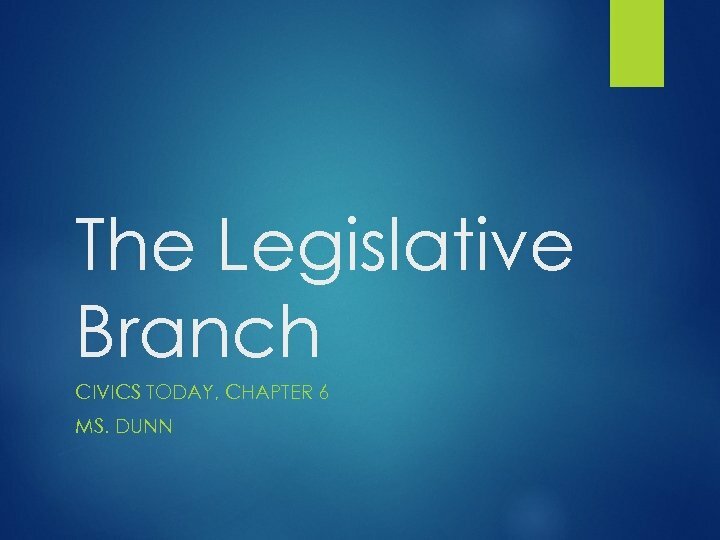 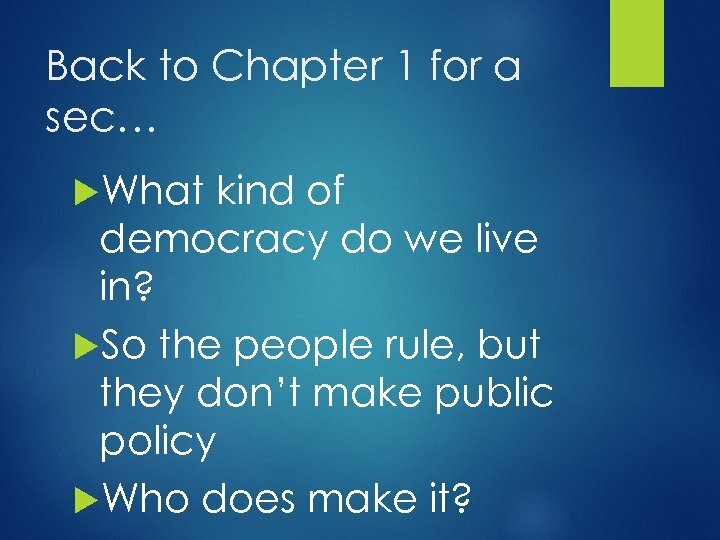 Back to Chapter 1 for a sec… What kind of democracy do we live in? 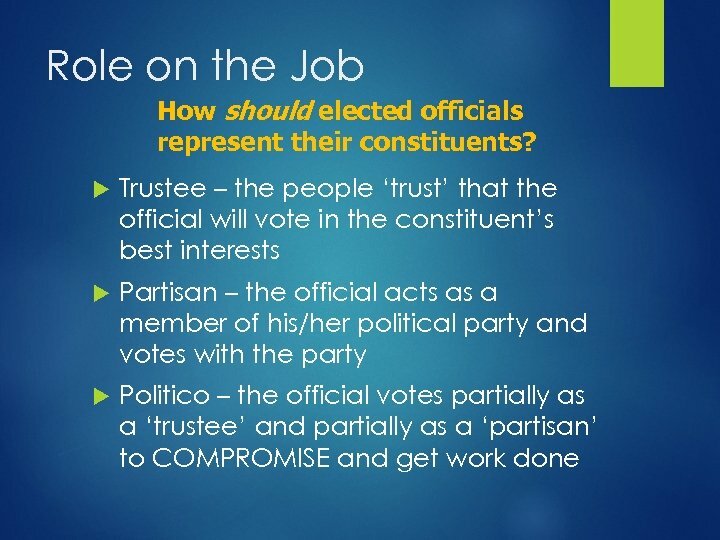 So the people rule, but they don’t make public policy Who does make it? 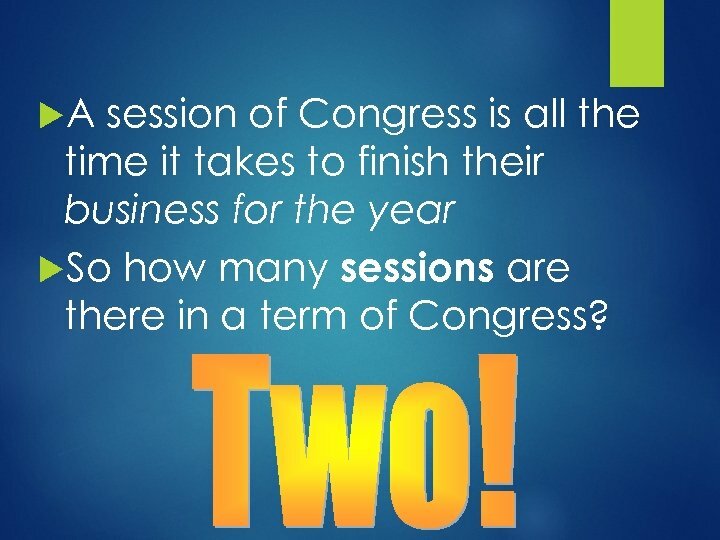 A session of Congress is all the time it takes to finish their business for the year So how many sessions are there in a term of Congress? 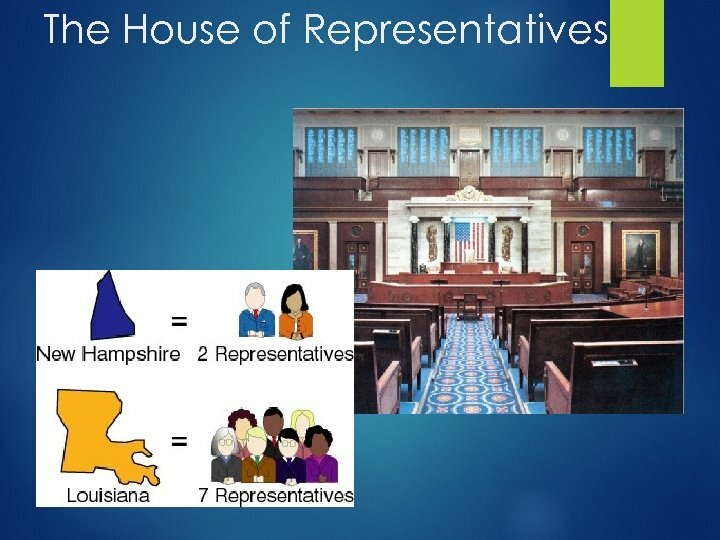 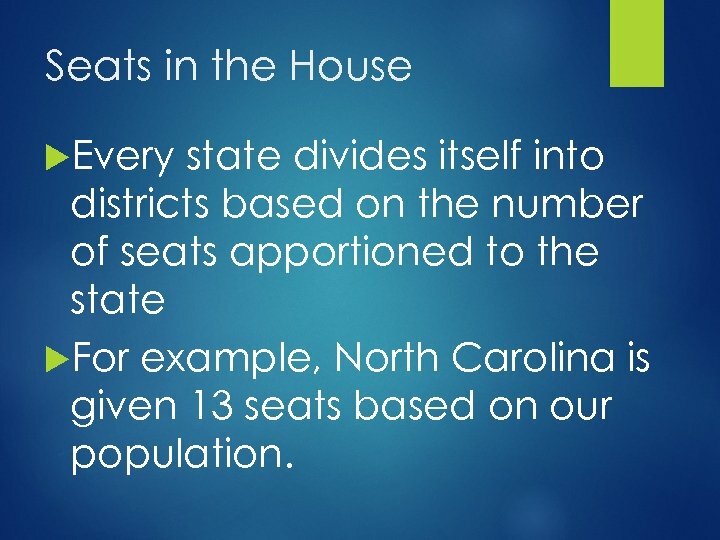 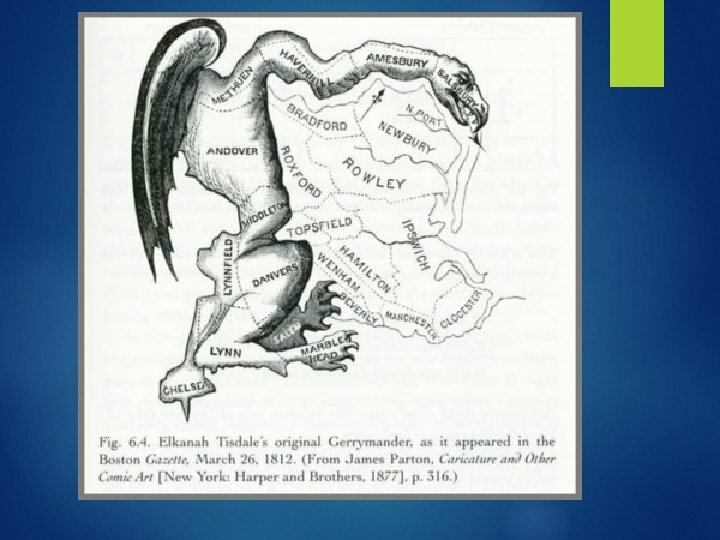 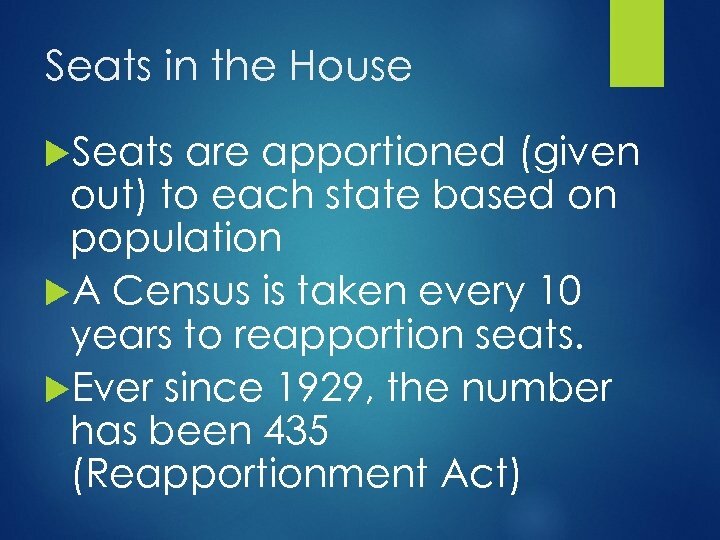 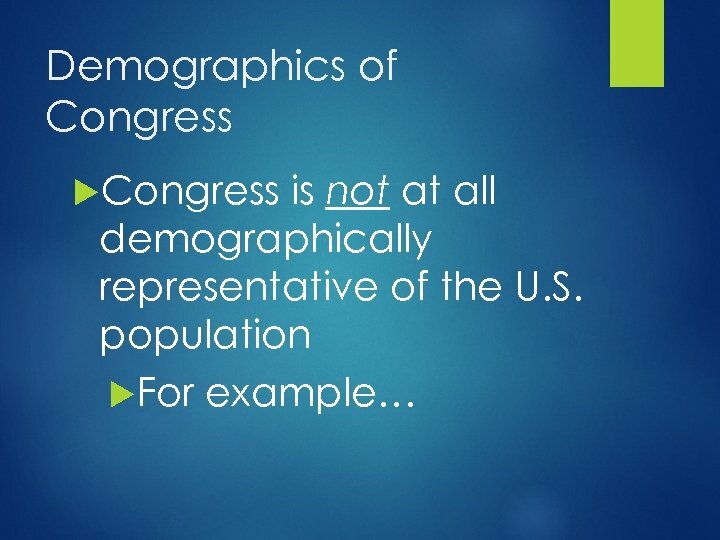 Seats in the House Every state divides itself into districts based on the number of seats apportioned to the state For example, North Carolina is given 13 seats based on our population. 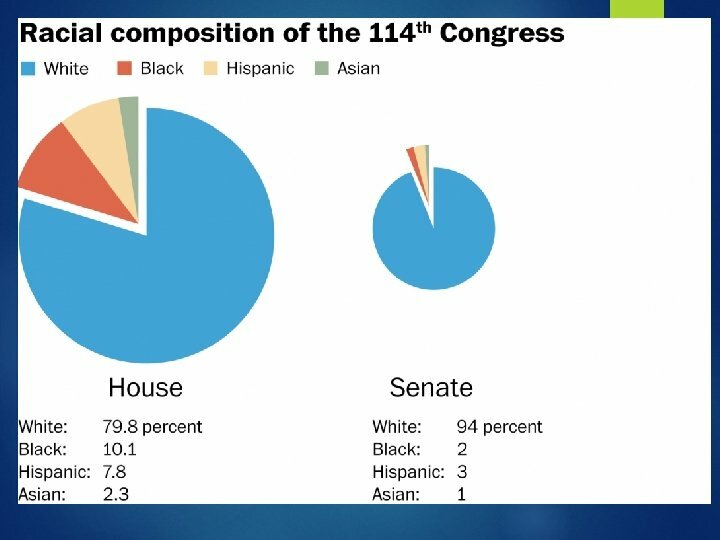 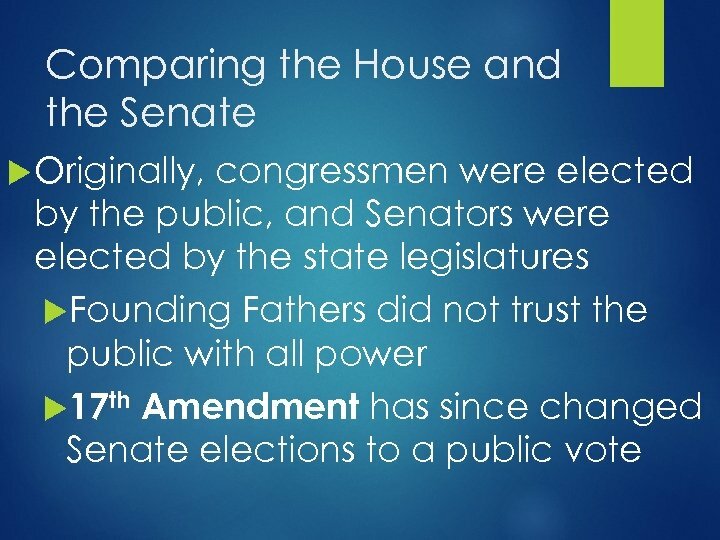 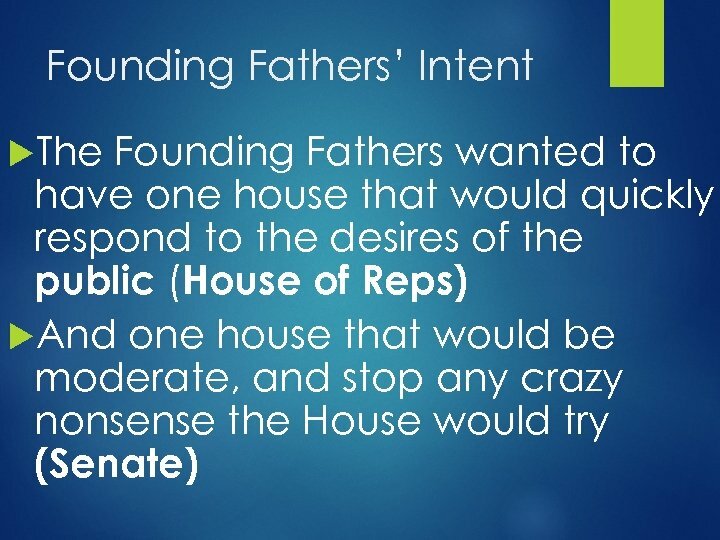 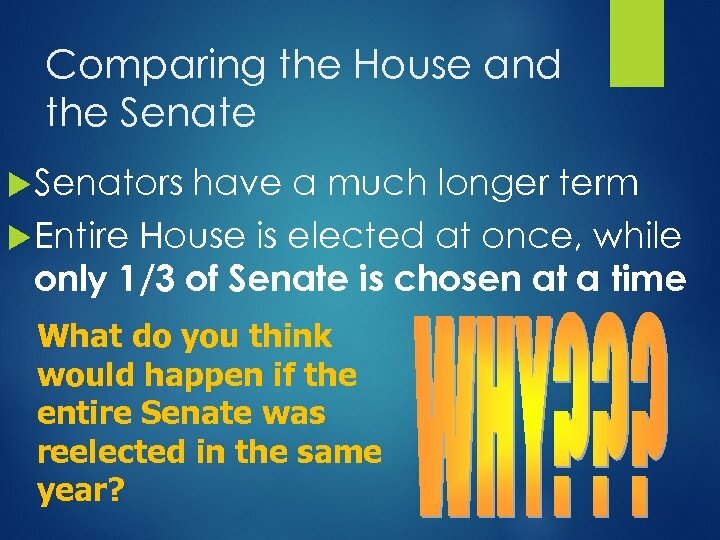 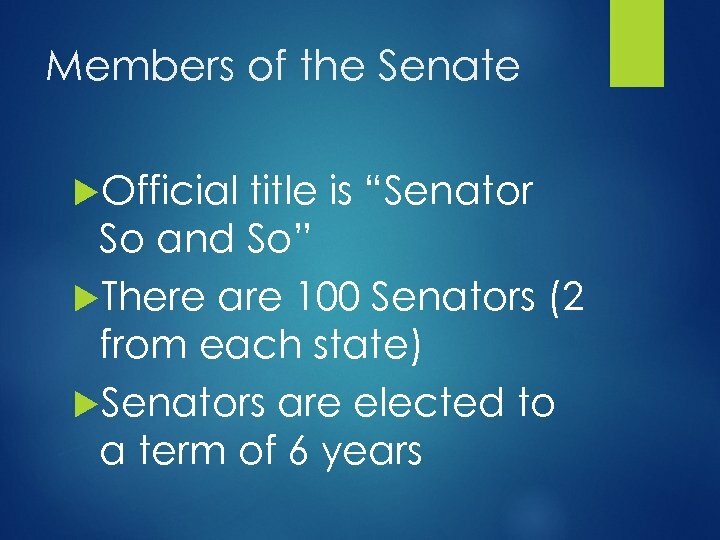 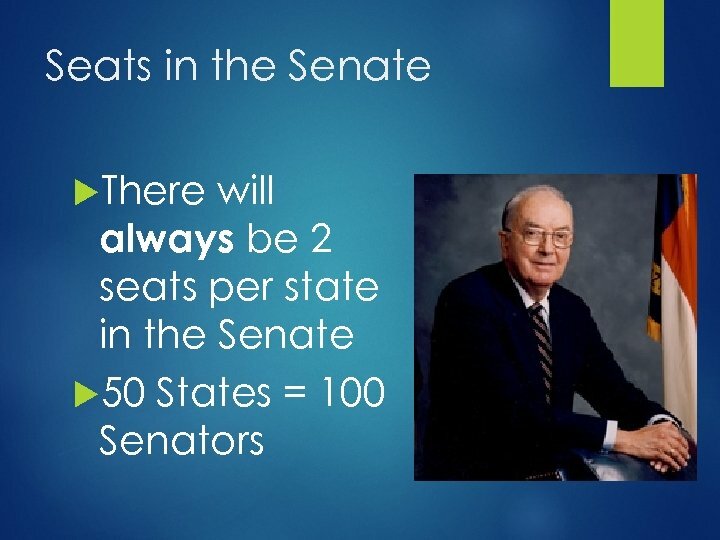 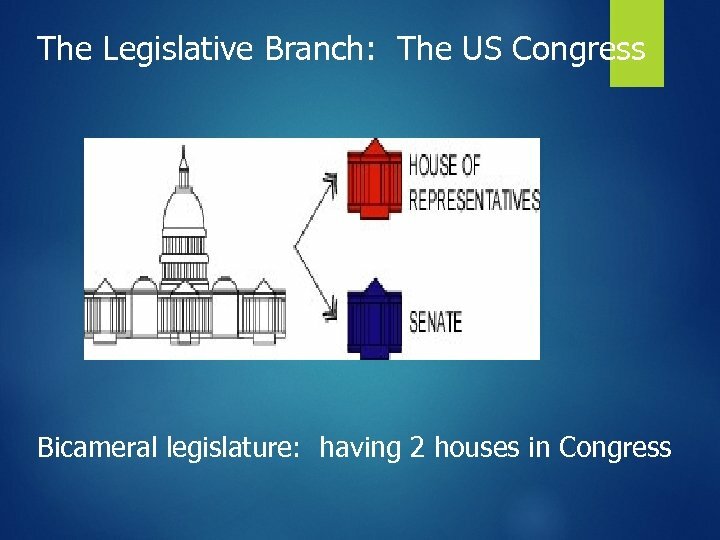 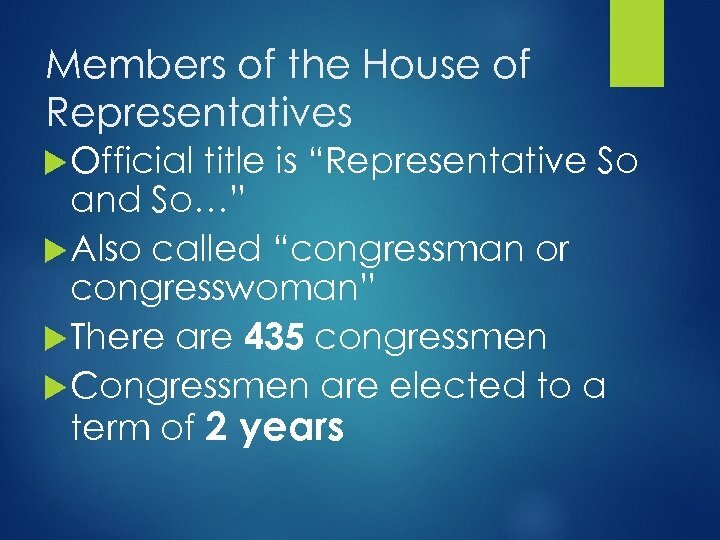 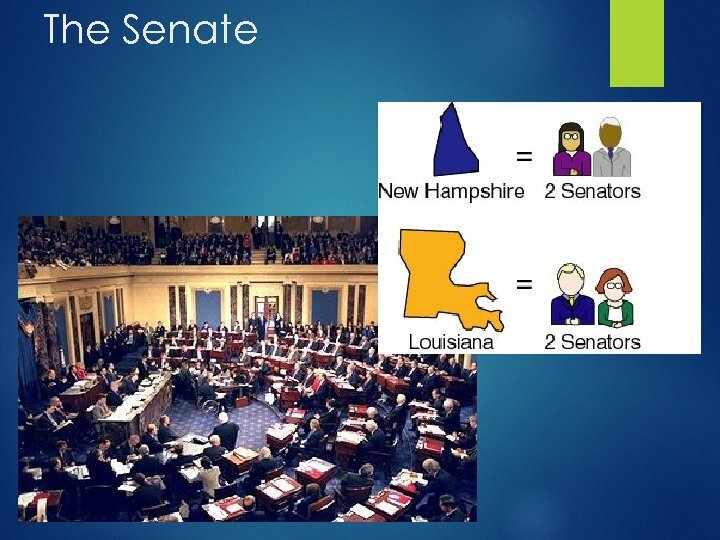 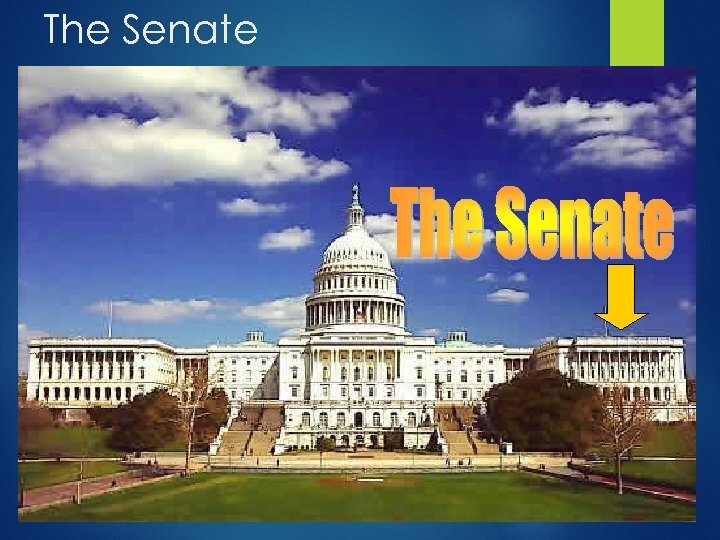 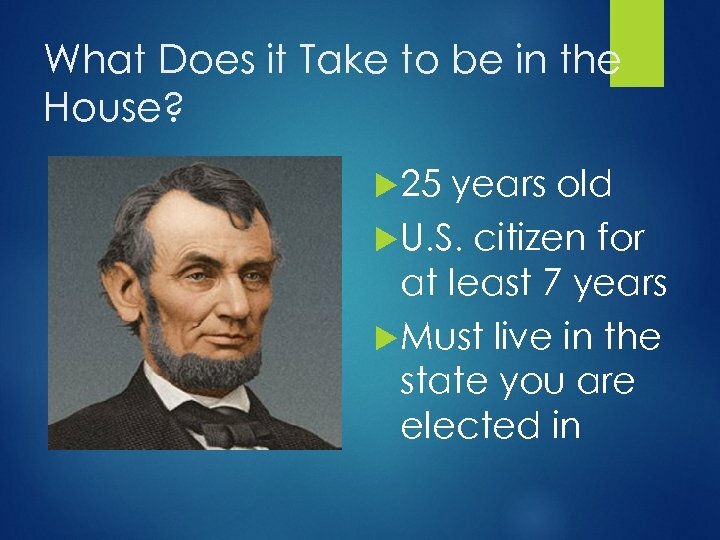 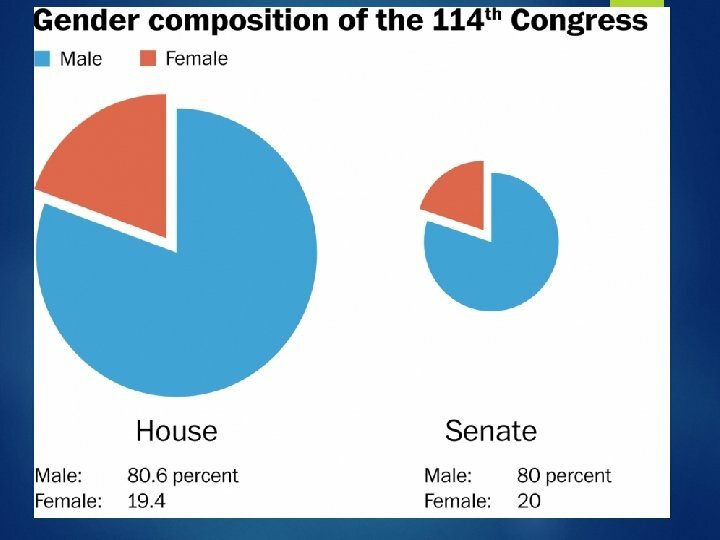 Comparing the House and the Senate Senators have a much longer term Entire House is elected at once, while only 1/3 of Senate is chosen at a time What do you think would happen if the entire Senate was reelected in the same year? 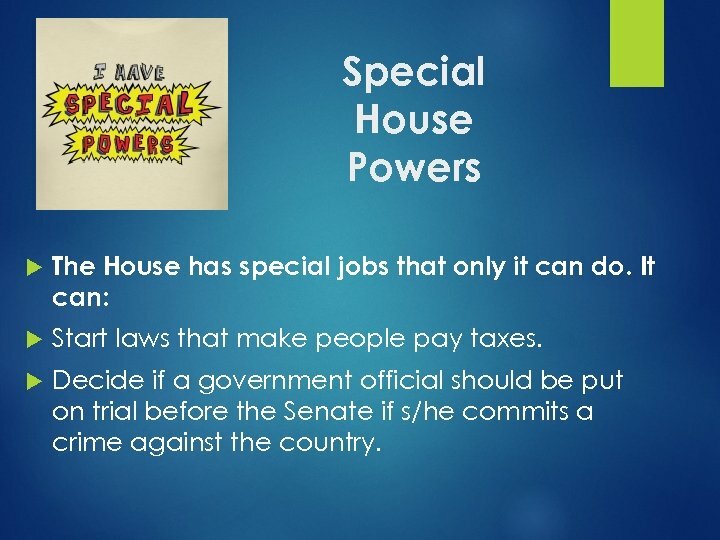 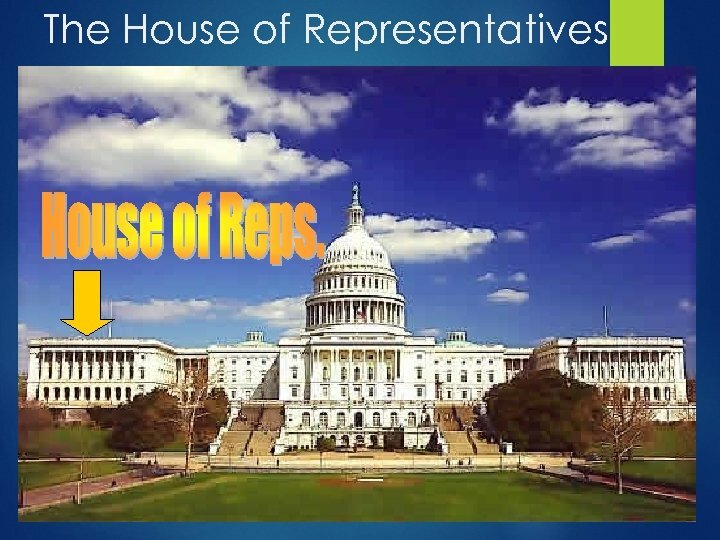 Special House Powers The House has special jobs that only it can do. 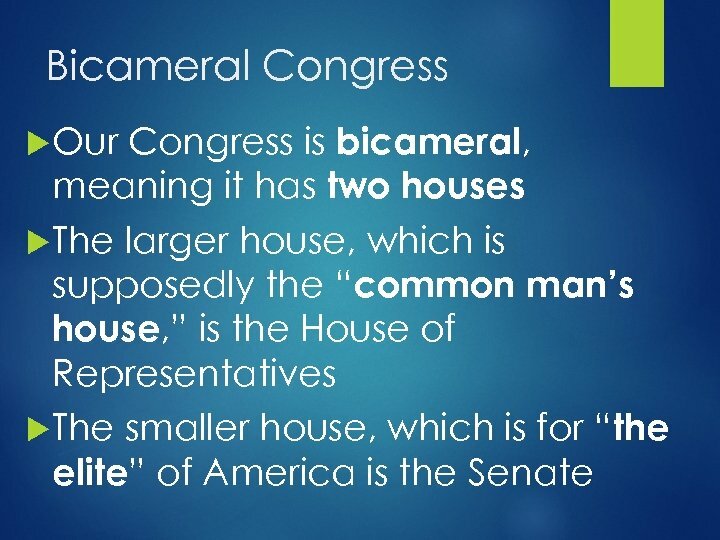 It can: Start laws that make people pay taxes. 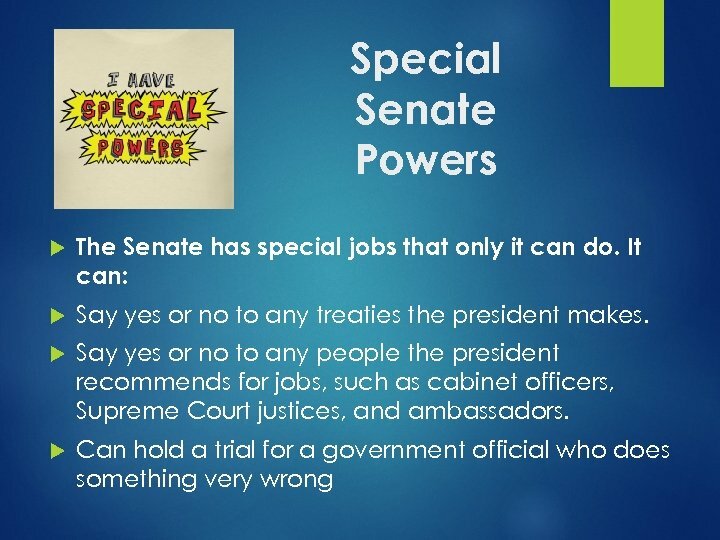 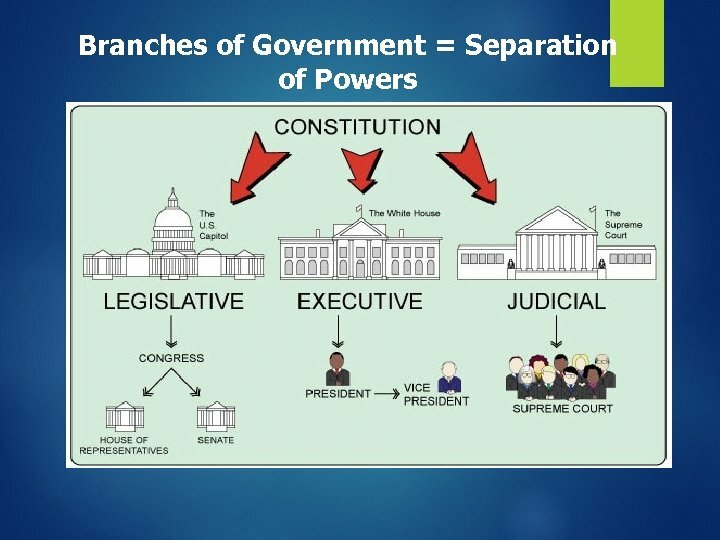 Decide if a government official should be put on trial before the Senate if s/he commits a crime against the country. 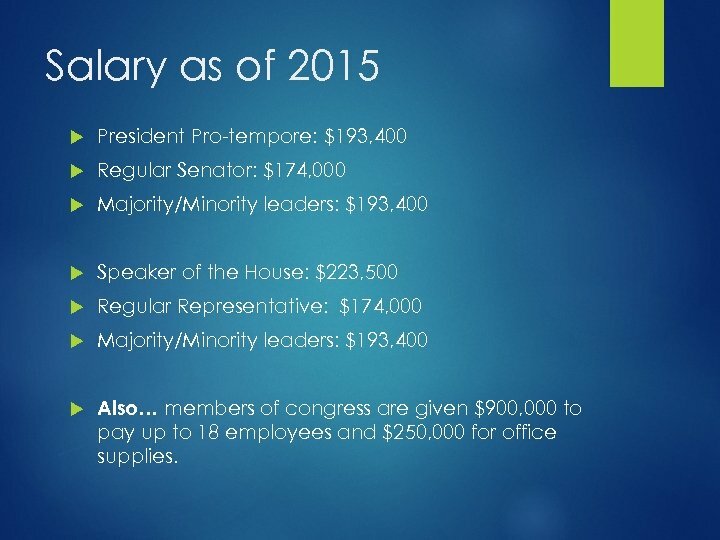 Salary as of 2015 President Pro-tempore: $193, 400 Regular Senator: $174, 000 Majority/Minority leaders: $193, 400 Speaker of the House: $223, 500 Regular Representative: $174, 000 Majority/Minority leaders: $193, 400 Also… members of congress are given $900, 000 to pay up to 18 employees and $250, 000 for office supplies. 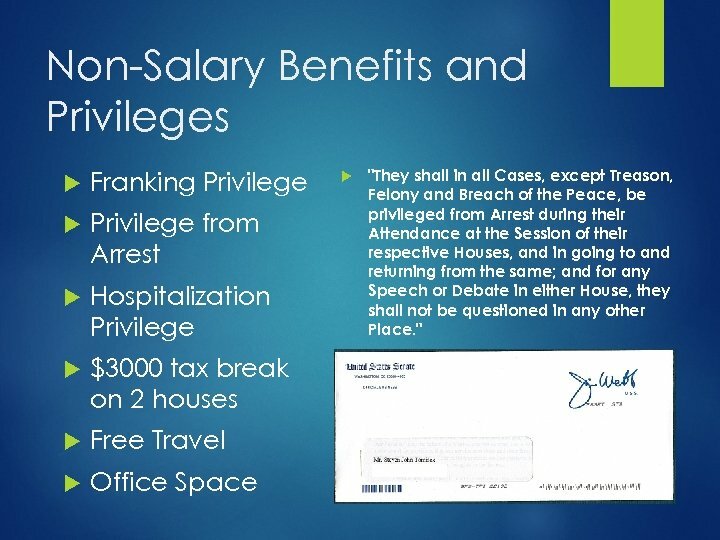 Non-Salary Benefits and Privileges Franking Privilege from Arrest Hospitalization Privilege $3000 tax break on 2 houses Free Travel Office Space "They shall in all Cases, except Treason, Felony and Breach of the Peace, be privileged from Arrest during their Attendance at the Session of their respective Houses, and in going to and returning from the same; and for any Speech or Debate in either House, they shall not be questioned in any other Place. " 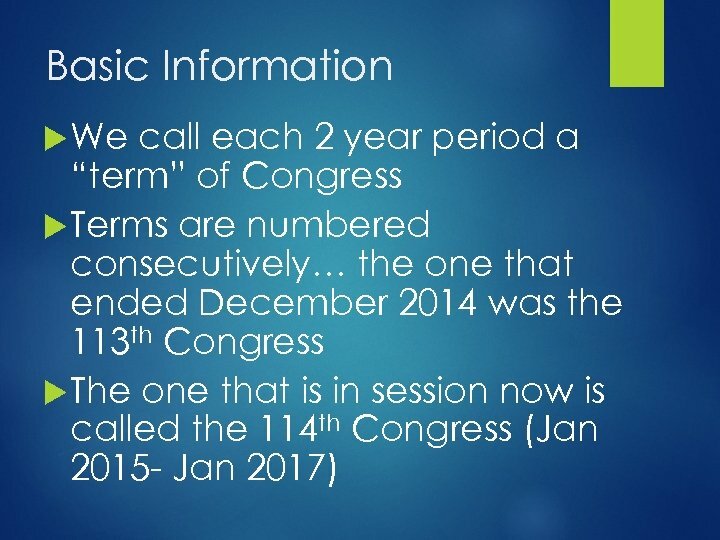 Lecture 1 LANGUAGE. 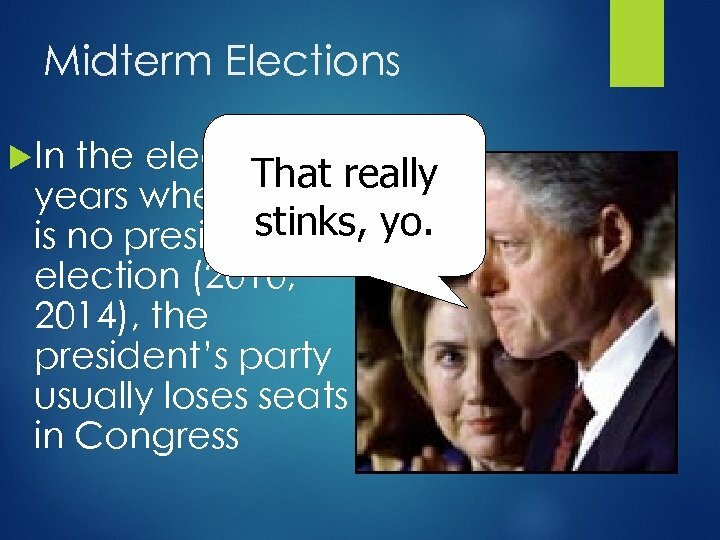 GENERAL NOTIONS. 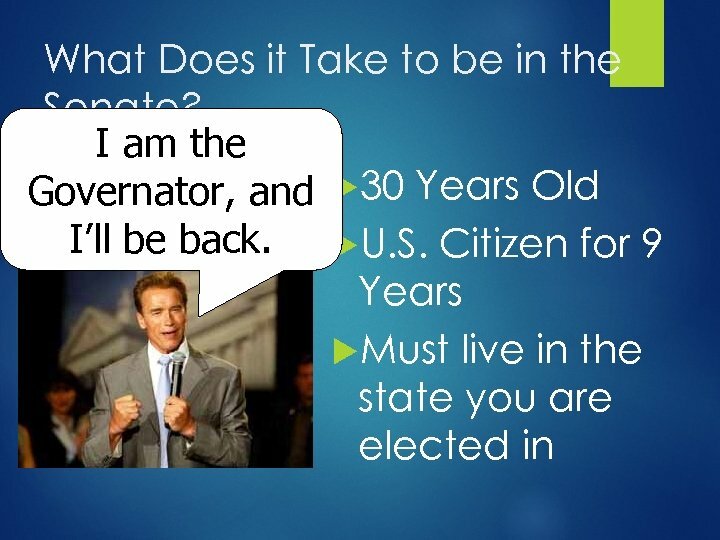 PLAN 1.